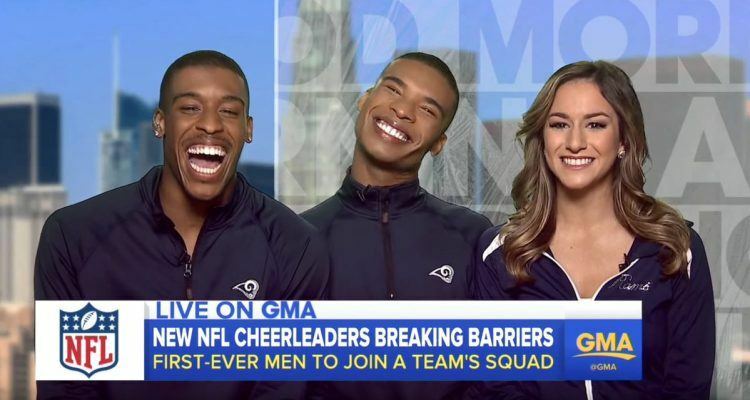 The NFL’s First Male Cheerleaders Will Make Their Debut This Season! History will be made this football season! According to CNN, for the first time in the NFL, male cheerleaders will be performing and cheering on the teams on the sidelines. Cheerleaders Quinton Peron and Napoleon Jinnies will be joining the Los Angeles Rams, and Jess Hernandez with the New Orleans Saints. “Still can’t believe I’m one of the first males in history to be a pro NFL cheerleader!” Jinnies tweeted after making the team. While the Indianapolis Colts and Baltimore Ravens have male stuntmen, these new performers are cheerleaders and will be dancing and cheering alongside their female teammates this season. Congrats to the fellas on making history!